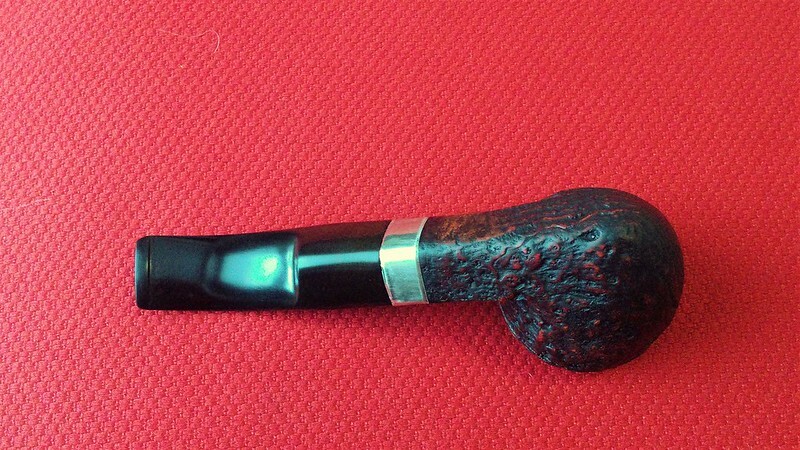 I spotted this Alpha pipe on eBay and managed to submit the winning bid at a price reflective of the pipe’s condition. It’s always nice when that works out. 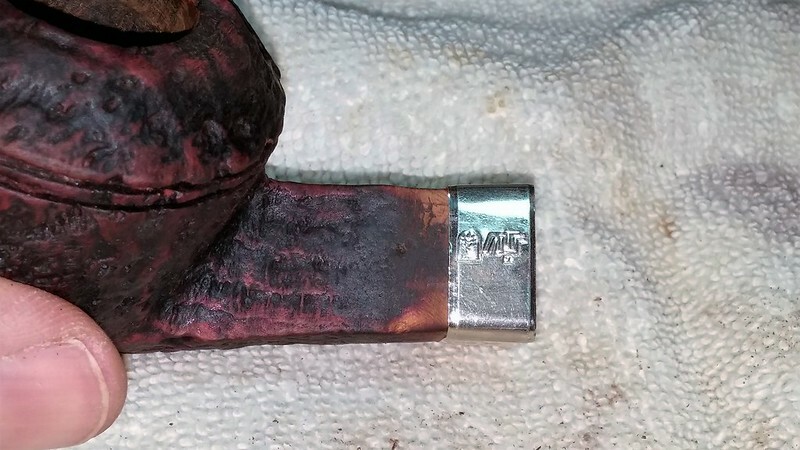 I think most other bidders were put off by the euphemistically described “hairline” crack running about 3/8” up the shank from the mortise, but as I had recently stocked up on repair bands, I figured I likely had one that might get the job done. 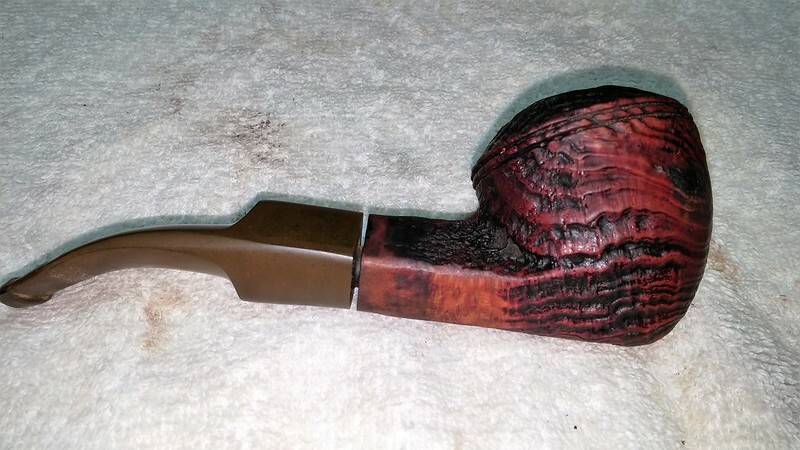 In due time the pipe arrived and I got my first good look at it (the pics online were, typically, not the best). 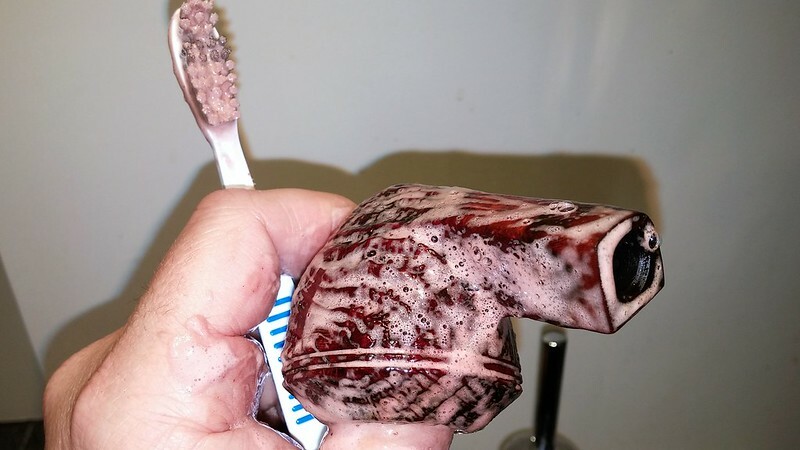 To say that the pipe needed a cleaning would have been a gross understatement. It was filthy, inside and out. 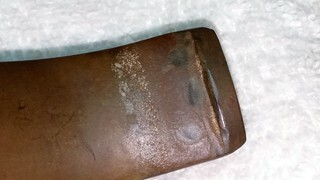 The ridges in the sandblast finish were visibly plugged up with dirt and grime, the rim was covered in lava that dripped back down the rear of the tobacco chamber, the chamber itself was nearly clogged with cake, and the stem couldn’t fit all the way into the mortise due to the buildup of crud in the airway. The stem was oxidized and grimy, with a crust of white salts and calcium at the bit and tooth dents top and bottom. Topping it off, the slot at the end of the bit was packed up with bits of old tobacco, tars and oils. 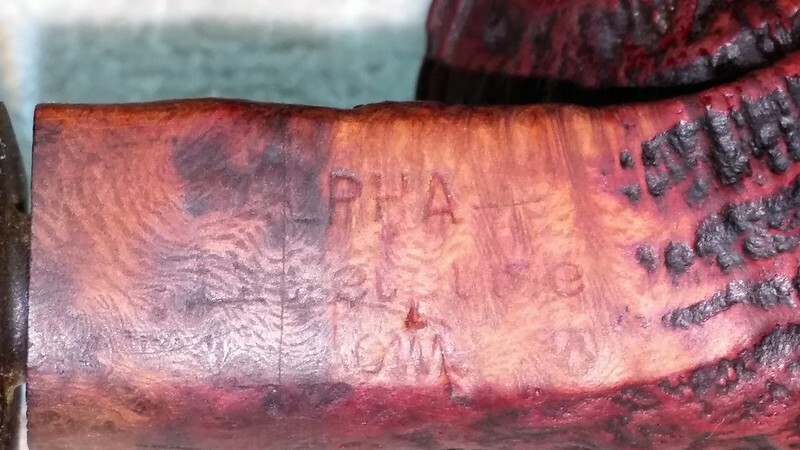 Pipedia tells us that the Alpha brand of pipes was one of two main brands of the now defunct Shalom pipe factory in Israel. 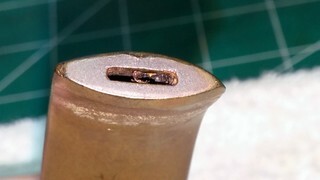 This bit of information helped in the deciphering of the faded stampings on the bottom right face of the diamond shank. As best as I can tell, the stamps read “Alpha” over “Enterprise” over “Shalom”, and a logo (?) of an “A” in a circle. 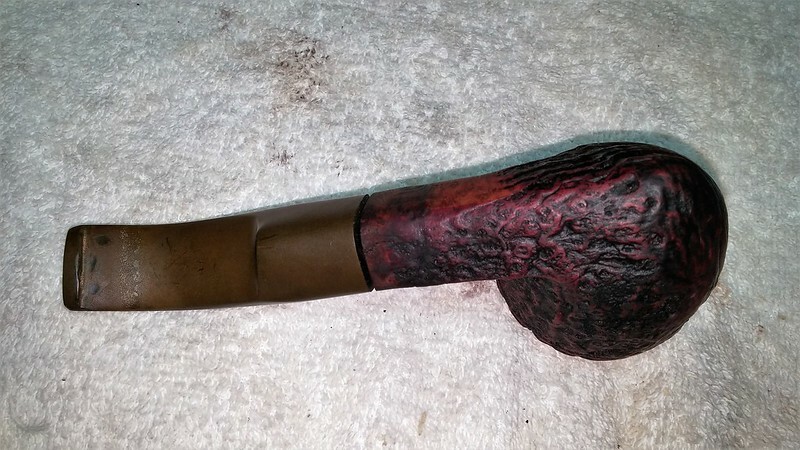 My best guess is that this pipe was made sometime in the 1960s or 1970s. 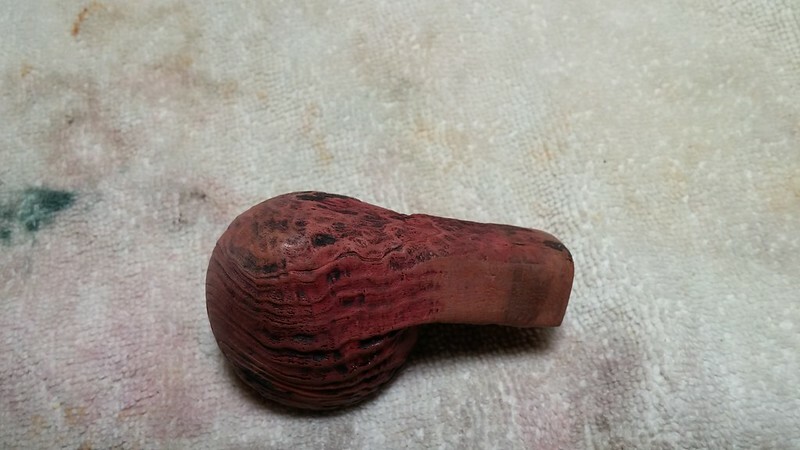 I started work on this pipe with a thorough reaming of the bowl back to bare briar. 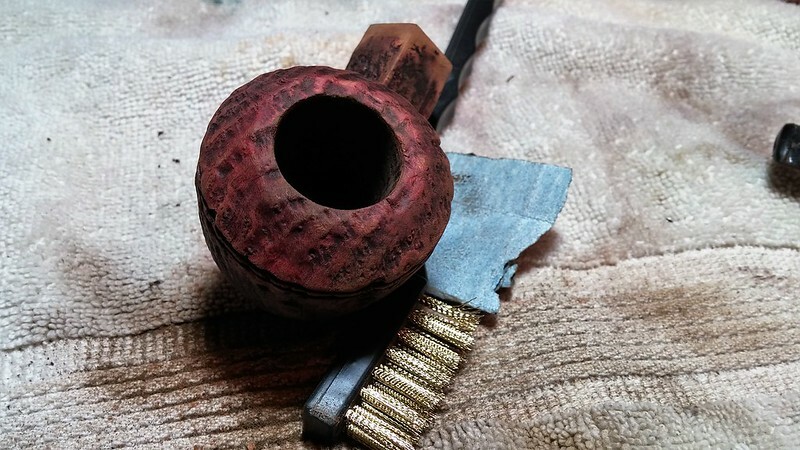 It is a large, conical bowl, so I found that 100-grit sandpaper wrapped around a dowel worked better than my Castleford reamer. As I progressed down the bowl, I pushed the sandpaper ahead of the dowel and was able to clean the bowl right to the bottom. 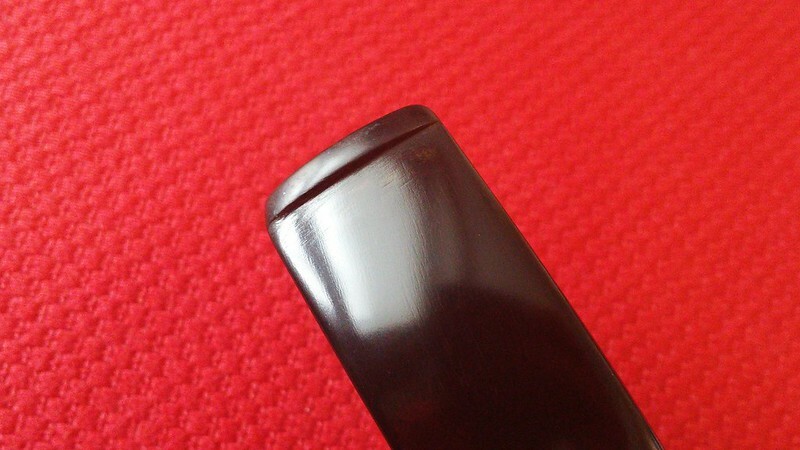 Surprisingly, the only damage to the bowl was a series of vertical scrapes up one side of the chamber wall, likely caused by the blade of a pen knife. While noticeable, they aren’t deep, so I left them alone and got on with the cleaning. 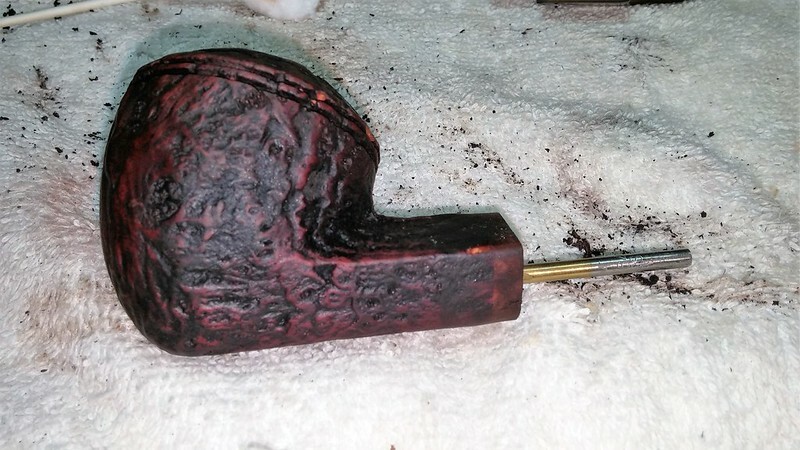 I used a brass bristle brush to scrub the lava out of the sandblasted rim. 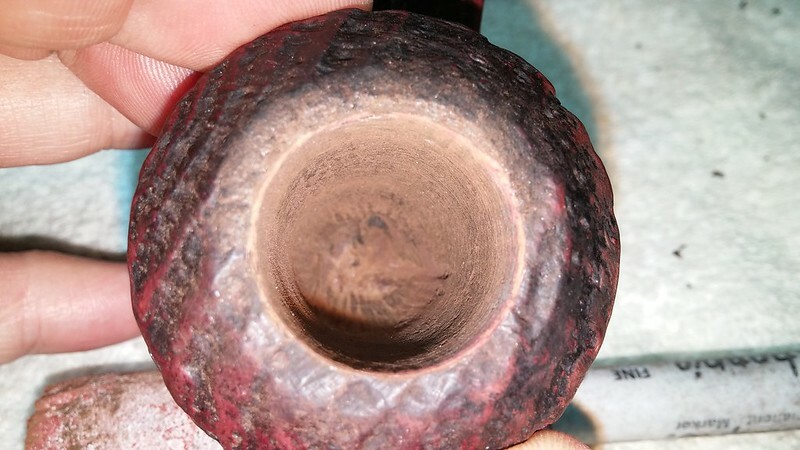 There were some stubborn spots around the rear edge of the bowl that I would revisit several times during this cleanup. 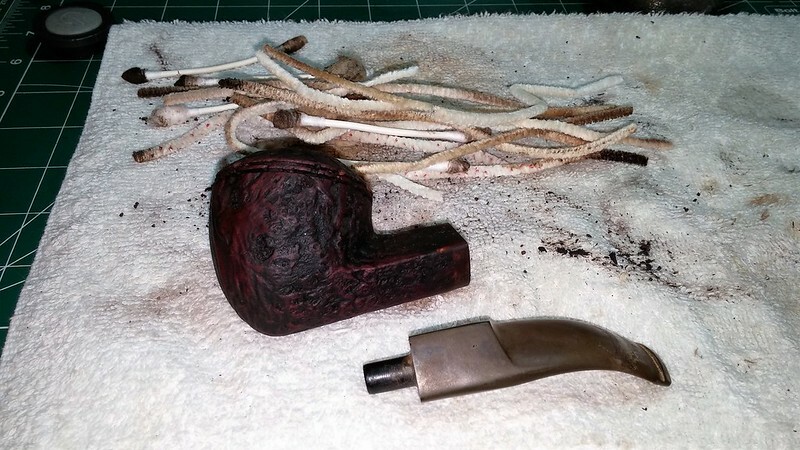 I aimed to use the retort to clear out the muck of ages in the pipe’s airway, so I used a few cotton swabs and pipe cleaners to clear the mortise enough to allow me to seat the pipe stem properly. I set up the retort and started boiling alcohol through the pipe. 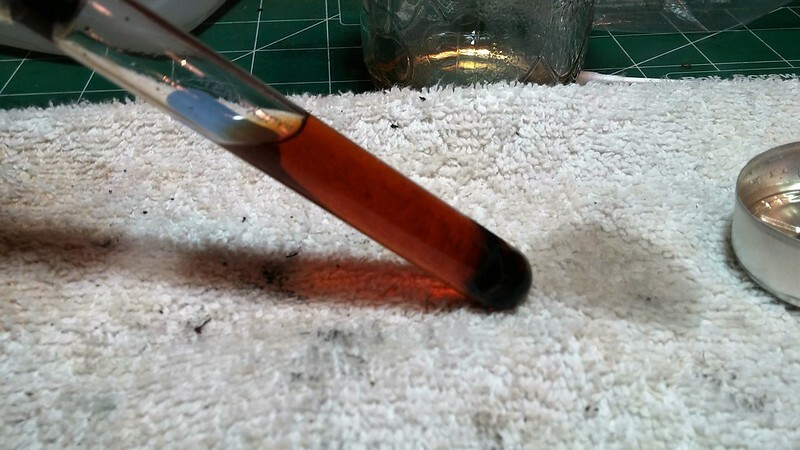 As expected, the first wash through the airway turned the clear isopropyl alcohol a murky black. Yuck. I dumped and refilled the retort, and repeated the process. 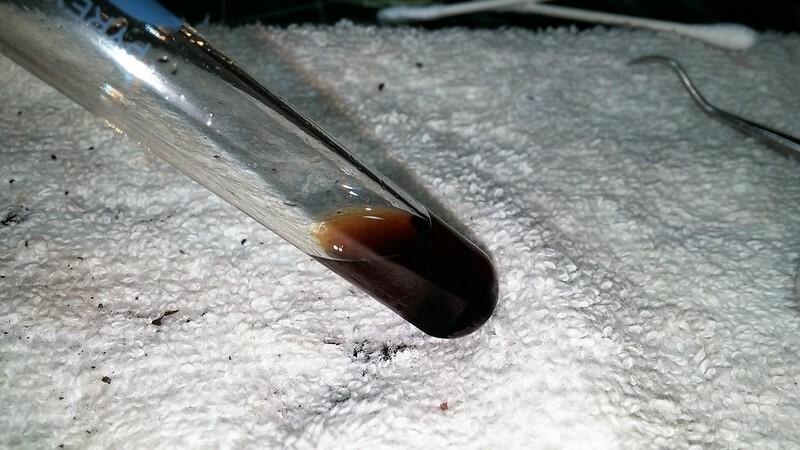 Again the alcohol came out very dark. 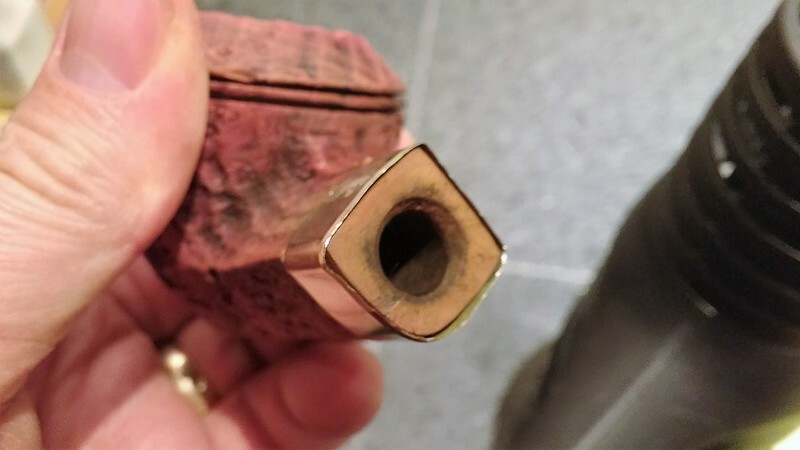 I realized that the pipe was dirtier than I had thought, so I changed tactics and used a series of small drill bits turned by hand to ream out the airway from shank to bowl. The “tar confetti” around the stummel in the pic below shows how much crud had accumulated. 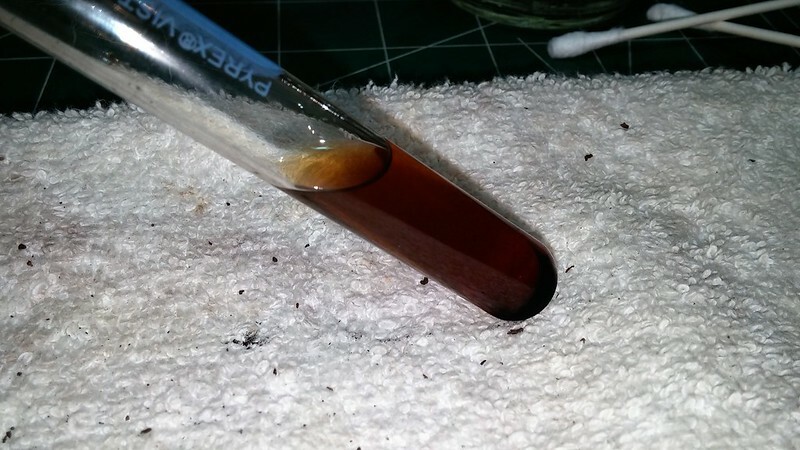 I then went back to the retort and ran two more tubes of alcohol through the pipe before switching back to pipe cleaners and cotton swabs to scrub out the remaining gunk. 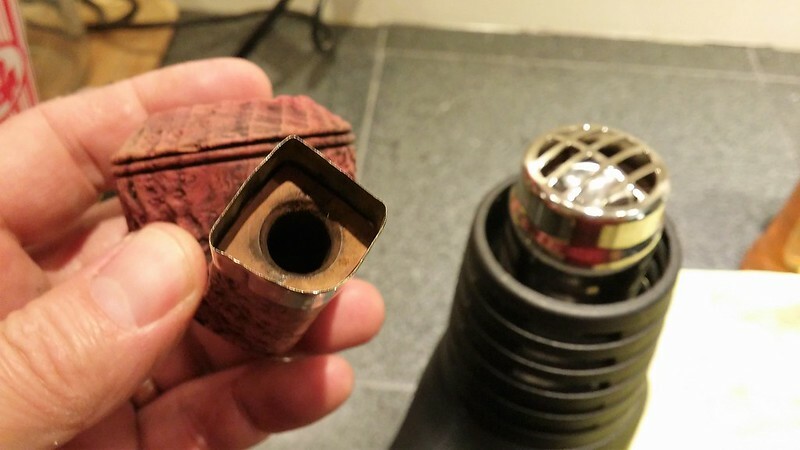 This was a heavy-duty cleaning to be sure, but the end result was a clean airway without any residual odours or ghosts of tobaccos past. Taking a break from cleaning, I decided to rough-fit a band for the shank. 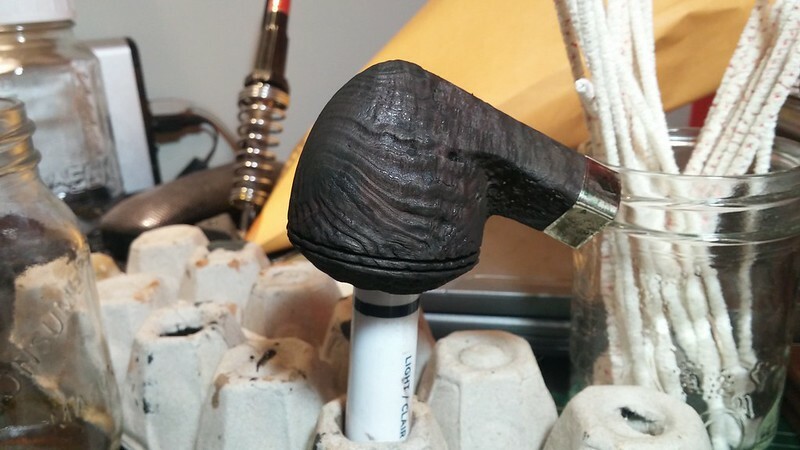 Given its chunky proportions, this shank required my largest nickel band – 19.5mm. I more or less centred the faux hallmarks of the band on the upper left face of the shank and started bending the round band to match the shank’s not-quite-diamond profile. 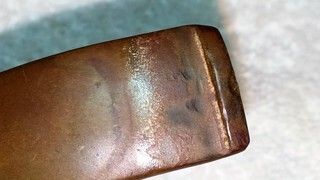 I sanded the leading edge of the shank lightly to knock down the edges of the sandblast and let the band slip on smoothly. 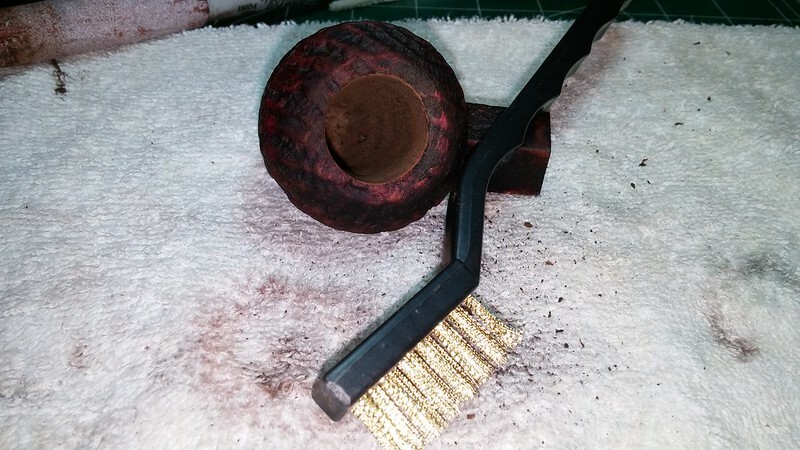 Before pressing the band home I gave the stummel a good scrubbing with a toothbrush and Murphy’s Oil Soap. Almost immediately, the soap suds turned from white to bubble-gum pink. A-ha! The grimy stummel and clogged finish now made sense. 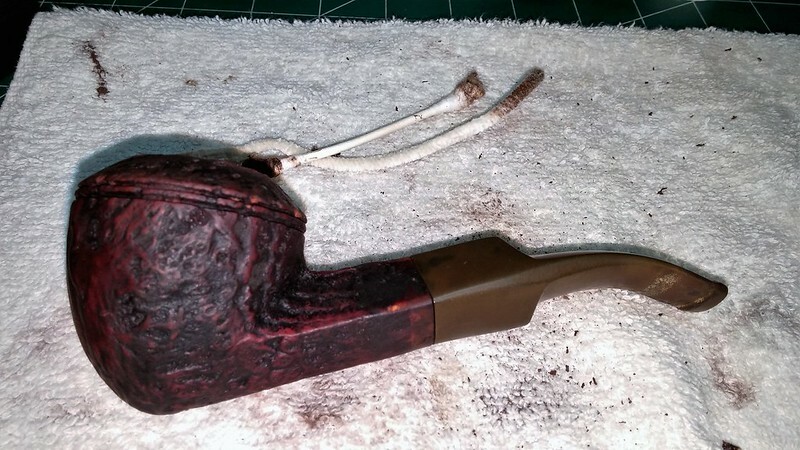 This pipe had been “refinished” at some point with a liberal application of oxblood shoe polish. 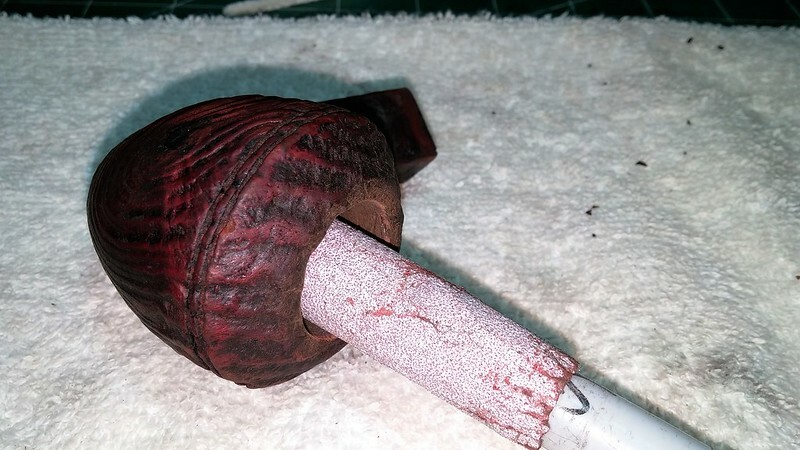 I’ve come across a handful of other pipes treated to this DIY finish, and it had always been a PITA to remove it. 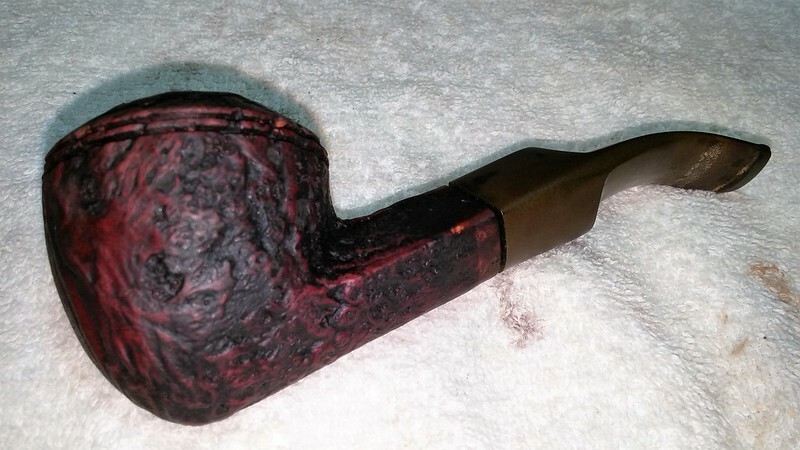 It took two scrubs with Murphy’s, a wire brushing, and two wipe-downs with acetone to get the briar to a state in which I would even consider refinishing. Yikes! I used a dental pick to clean out the twin bowl rings. They were nearly full of shoe polish. 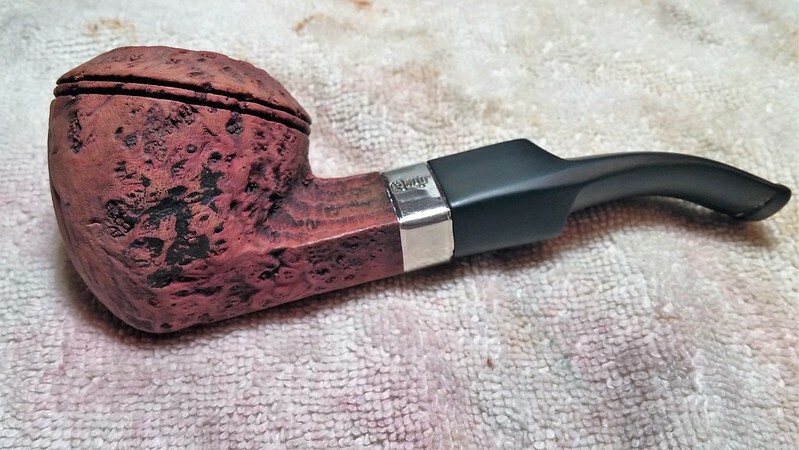 I thought I was finished with the hard graft of cleaning this stummel, but the dental pick found even more crud lurking in the deeper pockets of the sandblast. I dropped the stummel into an alcohol bath for an overnight soak in an attempt to dissolve the last of the shoe polish. This did the trick, but check out my alcohol jar. After soaking overnight, there was a ring of red polish colour around the inside edges of the jar. Gross. Time for new alcohol for the next pipe! Here’s the stummel after all that effort at cleaning. Looking not to bad now. 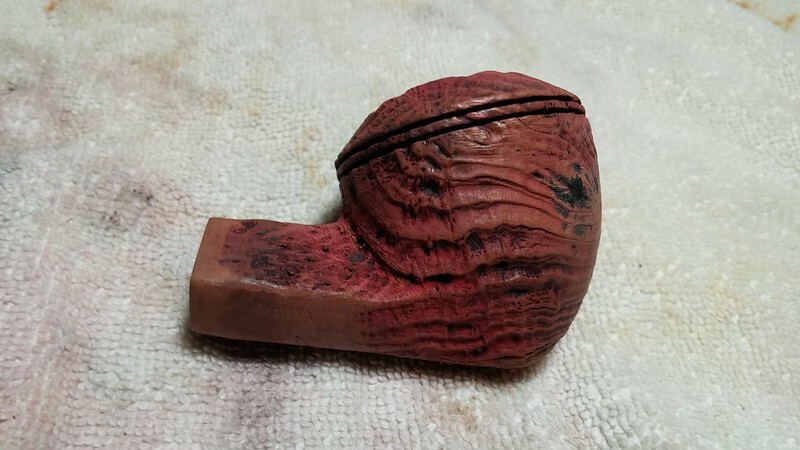 The briar is stained red in places but no more colour wipes off with acetone. 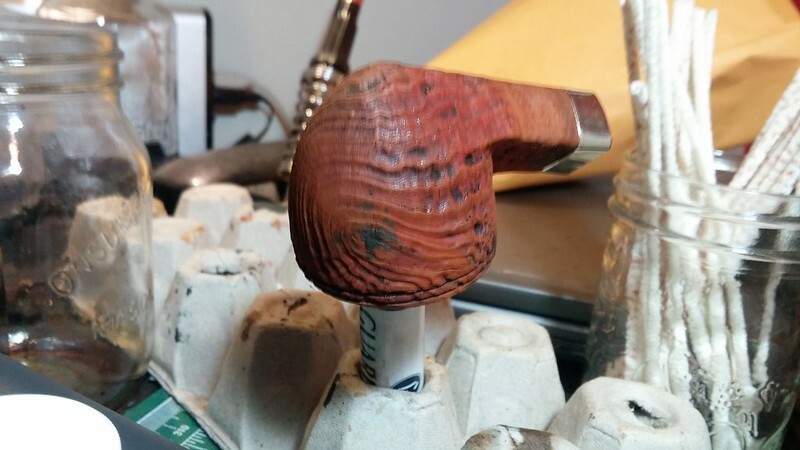 Now that the briar was (finally) clean, I fit the nickel band to the shank. 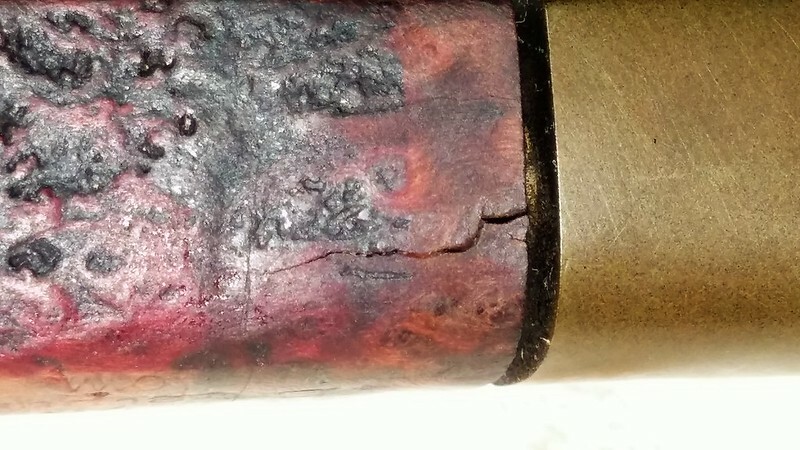 I dripped a bit of CA glue into the crack to seal it up, and then held the shank over the heat gun to expand the band enough for me to press it home. When it cooled, I had a nice tight pressure fit. 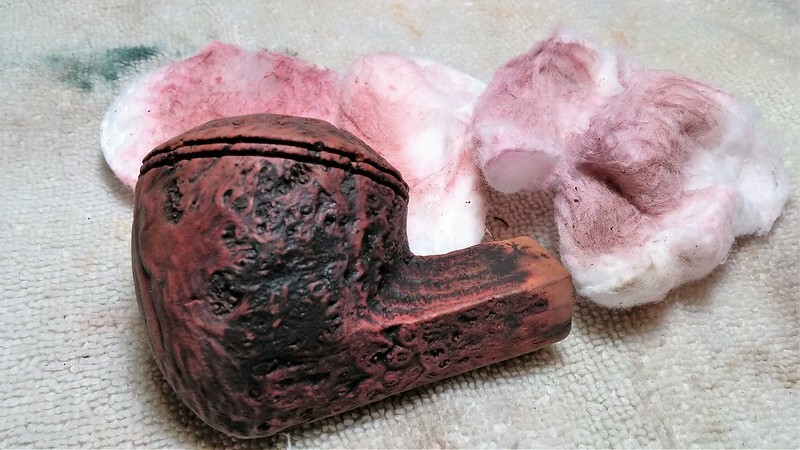 Meanwhile, the stem had been sitting in its own bath of Oxyclean and warm water to loosen up the grime and lift the oxidation to the surface of the vulcanite. I used 0000 steel wool and 600-grit sandpaper to scrub the stem clean and ran a few pipe cleaners through it to clear the airway. Thankfully the stem was a lot less troublesome than the stummel! I cleaned up the tooth dents by drop-filling them with CA glue and sanding everything smooth after the glue cured. 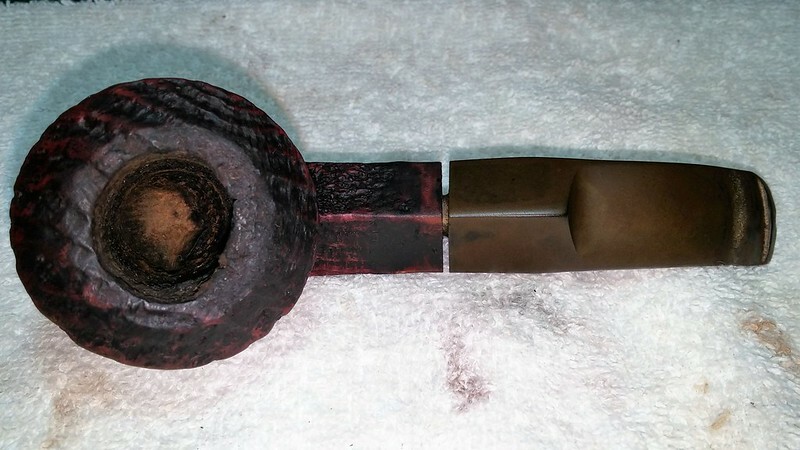 I forgot to take pics of the stem cleaning, but here’s one of the cleaned and banded pipe reassembled. Eager to finish up this restoration, I move ahead with staining. 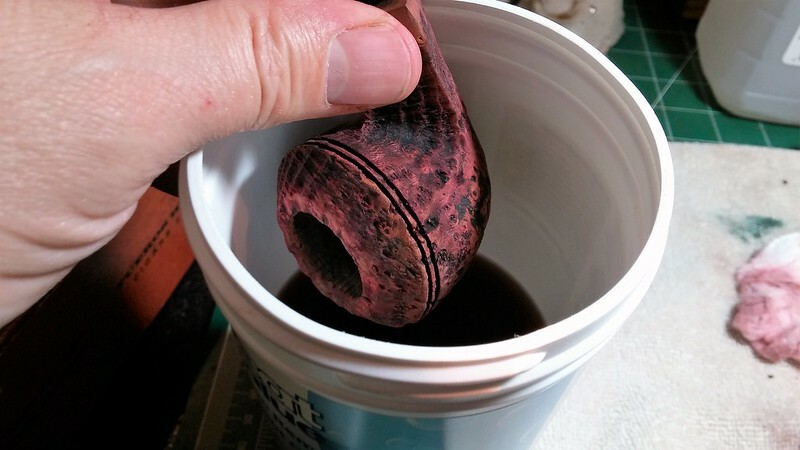 I first applied a heavy coat of Fiebing’s Saddle Tan leather dye to help even out the colour of the briar. I let this stain dry, buffed off the excess with an old towel and then applied two coats of Black dye. 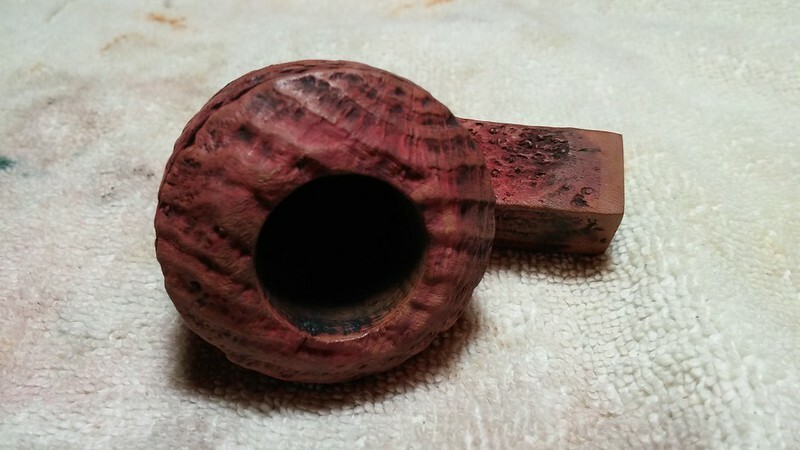 When the dye was dry, I scrubbed the stummel with 0000 steel wool to remove the black dye from the high points of the sandblast, revealing the tan briar underneath. 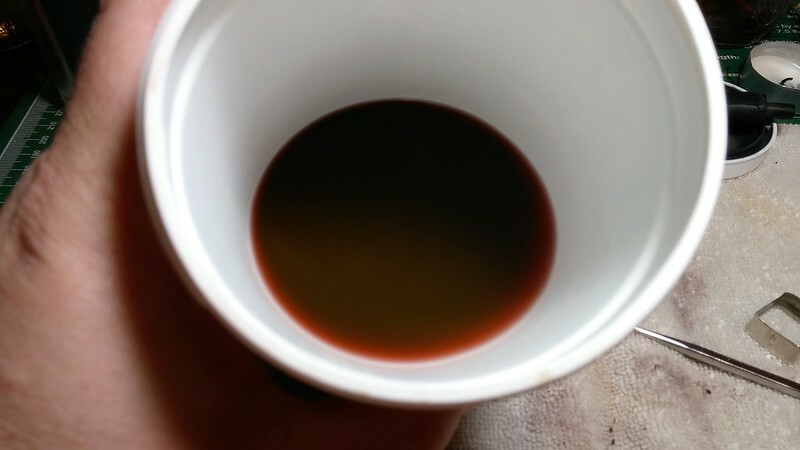 A wipe with mineral oil helped settle the new stain and enlivened the colours considerably. Finally the pipe was ready for buffing and waxing. I gave it a light run of White Diamond compound and applied several coats of Carnauba wax. This Alpha is ready now to serve a new piper for years to come. 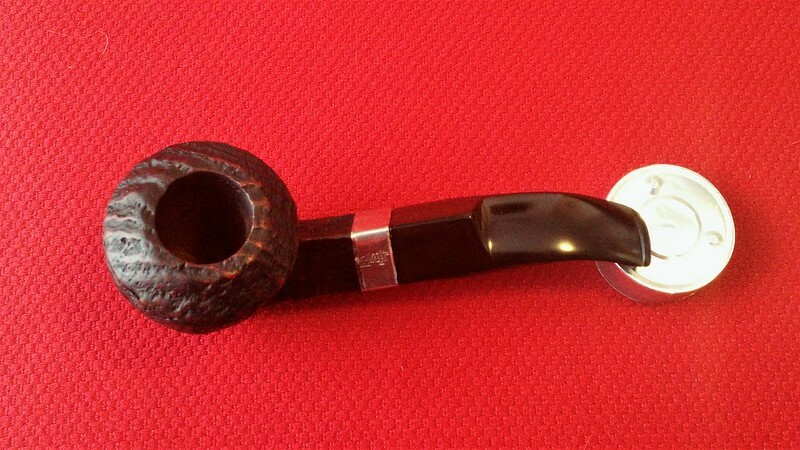 It was apparently a favourite of its original owner, so I have high hopes for the pipe’s smokability. It has certainly stepped up a few notches cosmetically. 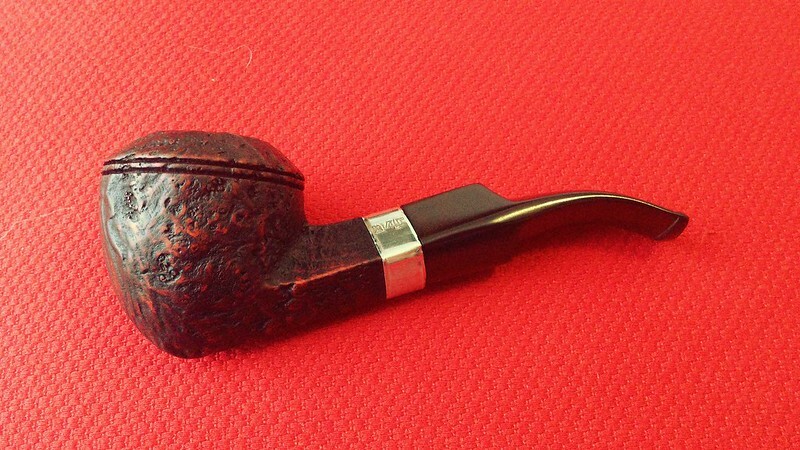 Who knew that this rather good looking pipe was hiding under all that muck? Beautiful restoration and banding, Charles. Did not think it would have come out as nice as it did. Bent Bulldogs and Rhodesians are my weak spot. Love this one. Thanks Al. I’m also a bit of a sucker for this shape. 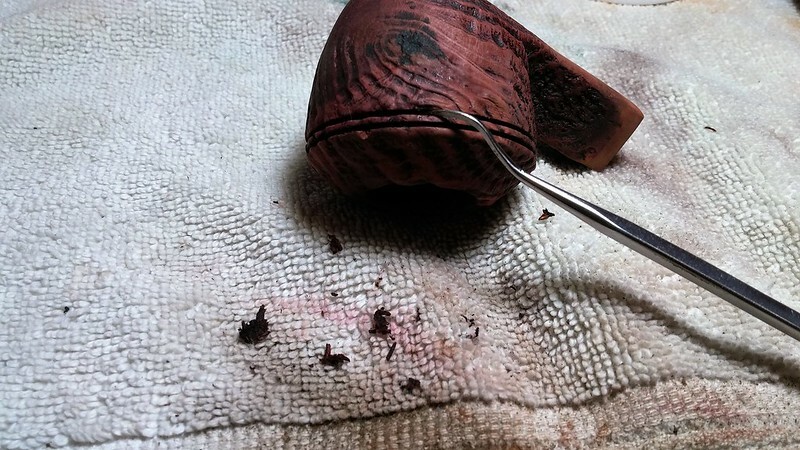 The pipe is a hefty handful of briar, but remarkably light for its size. 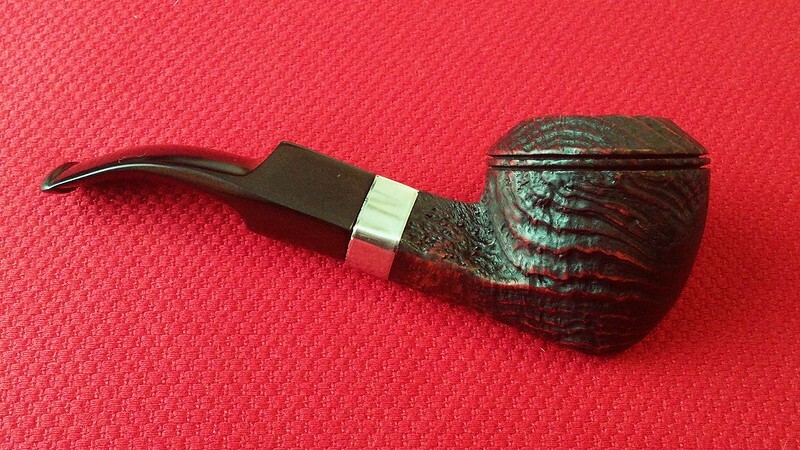 Should be comfortable for almost all pipe smokers. I think a band looks best on a short bent like that . This is a great refurb. The process Charles used in cleaning and restoring it are great examples of how to move through a clean up. Cheers, Steve! I try to work from gentlest methods to progressively invasive methods as necessary for each pipe to get the job done. 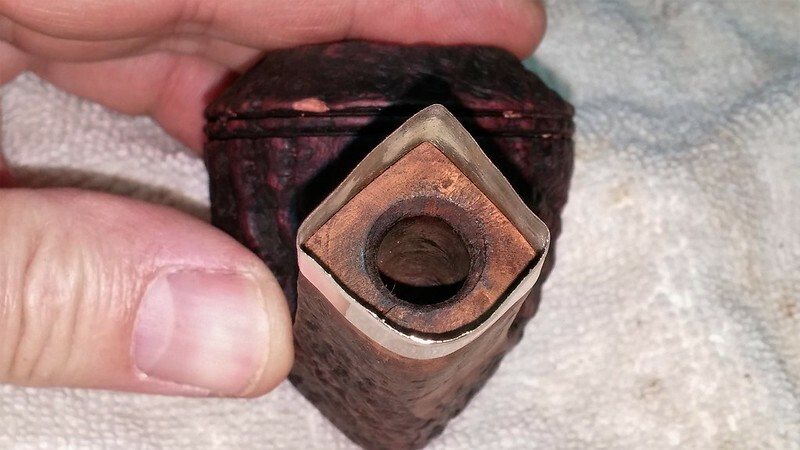 Do only what is needed to restore the pipe without going overboard. Beautiful, nice job with the band.